It's literally 4 am. I have no life. Beautiful artwork. Kion is one of my fav character in The Lion Guard in equality with Jasiri. He look awsome. You are pretty much welcome my friend. It's a great pleasure for me to write this comment my friend. I like a lot Kion and in my stories, Kion have multiples girlfriends, not he love them all, but a lot of females characters are in love with him Simba see that a opportunity to make alliance with a lot a Countries. 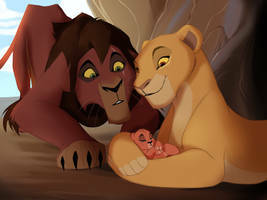 But Jasiri still his fav. Mate... He creates his own Pride with Jasiri and his multiples wives. I will publish a list if You want. Good old Kion. He's been my favorite since day one of the Lion Guard show. Of course. And thank you. An adult Kion this good-looking shows you do have a life! What do you mean. Doing something you enjoy is totally having a life. Awesome Adult Kion. He looks really good! He looks like a good mix of his parents, especially in the face! Kion looks amazing, good job. Wanna talk about Kion? Or TLK in general ^^?